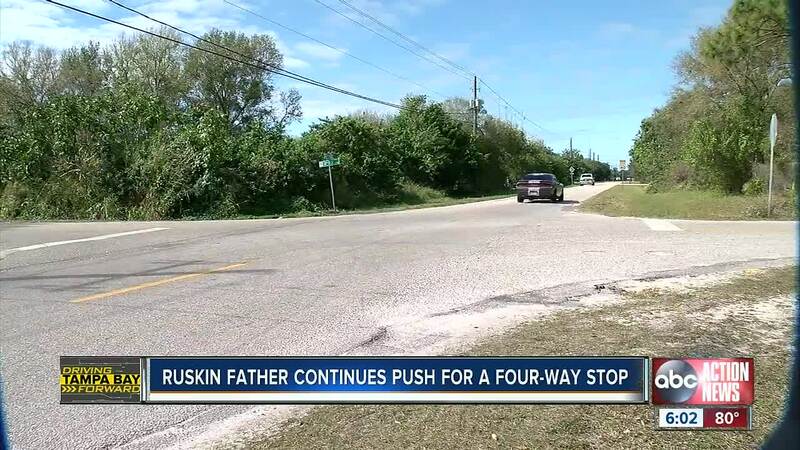 Along a rural stretch of road in Ruskin, neighbors say they've been begging for years for a stop sign to help slow drivers down and save lives. Along a rural stretch of road in Ruskin, neighbors say they've been begging for years for a stop sign to help slow drivers down and save lives. ABC Action News first did a story in 2017 about neighbors asking for a four-way stop, but were told there's not enough traffic. Aaron Cook said there have been at least two crashes along 20th Avenue Southeast so far this year, and worries that if something is not done someone else will die. Cook said his neighbors were killed at the intersection of 20th Avenue Southeast and 30th Street Southeast, and others have died as well. He tells ABC Action News that the crashes are under reported, as he says he's seen at least half a dozen crashes last year alone. According to data from the Hillsborough County Sheriff's Office, there have been seven crashes at the intersection since 2014. "The community wants to put a petition out but don't really know who to turn to, " he said. Cook said representatives from the county have told him that there is not enough traffic along the road for a four way stop. ABC Action News first reported on the request in 2017. After we reached out to the county again, they told us they are going to re-look at the intersection. In an email they said, "we have a consultant currently reviewing 21st and 1st. We will add 21st and 30th to their review."